Background: Hepatocellular carcinoma (HCC) is related to chronic liver inflammation. 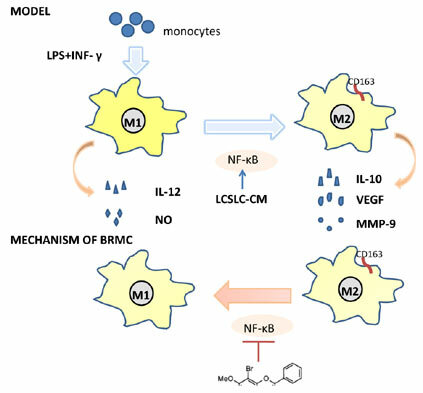 M2 polarization of tumor-associated macrophages (TAMs) in the tumor microenvironment promotes liver cancer stem-like cell (LCSLC) self-renewal capability and carcinogenicity. Therefore, reversing M2 polarization of TAMs could be an effective approach to cure HCC. Objective: To evaluate whether 8-bromo-7-methoxychrysin (BrMC) has an effect on M2 polarization of TAMs. Method: LCSLC and conditional medium were obtained by sphere forming assay. Identification of LCSLC were analyzed by sphere forming, wound-healing and invasion assay. TAM and effects of BrMC on it were validated by immunofluorescence staining, ELISA and griess assay. Expressions of cancer stem cell and macrophage marker were analyzed by western blotting. Results: Our results showed that BrMC significantly suppressed the expression of the M2 macrophage marker CD163. Furthermore, BrMC influenced the secretion profile of cytokines of TAMs. Mechanistically, BrMC reversed M2 polarization of TAMs due to inhibition of NF-κB activation. Conclusion: BrMC may be a potentially novel flavonoid agent that can be applied for disrupting the interaction of LCSLCs and TAMs. Keywords: Hepatocellular carcinoma, tumor-associated macrophage, M2 polarization, cancer stem-like cell, chrysin analogue, NF-κB. Keywords:Hepatocellular carcinoma, tumor-associated macrophage, M2 polarization, cancer stem-like cell, chrysin analogue, NF-κB. Abstract:Background: Hepatocellular carcinoma (HCC) is related to chronic liver inflammation. M2 polarization of tumor-associated macrophages (TAMs) in the tumor microenvironment promotes liver cancer stem-like cell (LCSLC) self-renewal capability and carcinogenicity. Therefore, reversing M2 polarization of TAMs could be an effective approach to cure HCC.